4. The main pocket is designated for the water bladder (Max 3L/100oz). It has the holder for both wide and smallmouth bladder. Two Front pockets can hold your wallet, keys, phone, towel, or small tool. 6. Comfortable and Adjustable shoulder/chest/waist straps fit anyone from teenagers to adults. 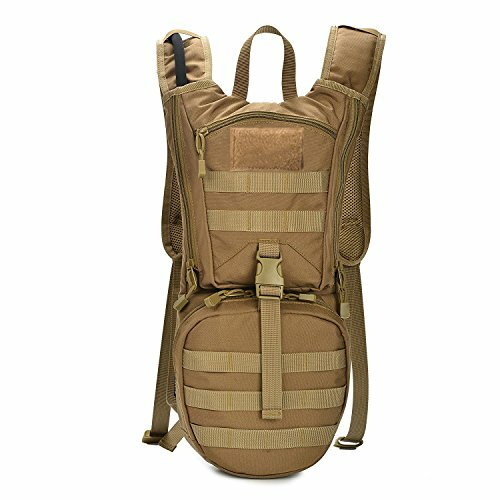 Hydration backpack Capacity:Includes a 3 Liter TPU bladder.size:19x46x21 cm(7.48"x18.11"x8.26"). Application: The rescue package is mainly for military and medical use, depending on the applicatio design, waterproof, wear, dirt .Military, mountaineering, riding, outdoor travel backpack can put any gaps where irrigation is simple, easy to drink, with the drink with smoke, soft and comfortable to carry. If you have any questions about this product by INDEPMAN, contact us by completing and submitting the form below. If you are looking for a specif part number, please include it with your message.